Christies auction house is set to auction off true little works of art that can be worn daily or just gazed at lovingly in your boudoir! What makes jewelry art? Well, I think we all know rarer bijoux examples, often made by hand such as Calder, Line Vautrin, or Louise Nevelson. They are art. However, in my mind jewelry is almost always an art form. And Christie’s is confirming it with their second Art as Jewellery auction Nov 6th –19th. Pieces can be perused online or at 20 Rockefeller Center Galleries from the 4th –13th. Of course we agree completely with their inclusion of handmade jewelry by BillyBoy* whose pieces have multiple layers and contain relics of couture past, such as glass sourced from Mme Gripoix long ago. Although, the plethora of works by artists here are sure to add to your definition of jewelry as art! BillyBoy* 1980s example featuring older couture elements in the design. See some of our favorite Christies picks that could be yours next week! *All images via Christies.com. Click the pic to visit the page. Chinese Imperial necklace, 19th century. Eden Fine Antique Galleries image. I often attend auctions, private sales, scout private collections, hunt abroad and on. I think fashion jewelry, collectors and accessories lovers alike will enjoy seeing them. Most of these are available accessories for purchase at auction or in shops, that I run across during my jewelry hunt. This week’s find is a Chinese Chinese Pearl Imperial Court ChaoZhu Beads. China, 19th C., Qing imperial court necklace. There two necklaces are my favorites from this auction and with the Met exhibit-China through the looking glass, these pieces fit the mood of the month. Offered at Eden Fine Antiques Galleries Showroom. Preview starts May 20th in Marietta Georgia. This is an online auction as well. Chinese Imperial necklace, 19th century. Eden Galleries image. Chinese Pearl Imperial Court ChaoZhu Beads. China, 19th C., Qing imperial court necklace comprised of well strung 108 natural round shape Pearls accented by four larger agate beads bordered with smaller green jade beads. circled toward the center Fotou connecting to a golden-yellow ribbon suspending Oval shaped Filigree emblem-ed with green jade, followed by a quartz crystal tear shaped pendant. Eden Fine Antiques Gallery description and image. Available at auction. Chinese ChenXiang Prayer’s Beads Necklace comprised of well strung carved round shape ChenXiang wood accented by three larger Tourmaline beads. Circled toward the center Jade Fotou followed with a double-gourd turquoise bead connecting to a golden-yellow ribbon suspending flower shaped cloisonne cartouche emblem-ed with oval shaped green jade, followed by brown and green tassels. Eden Fine Antiques Gallery description and image. Love a good dragon? Feeling a bit Daenerys Targaryen? Well, so do we; the “webitorial” now posted on Jute Fashion Magazine’s website today, shot by none other than the talented Hannan Saleh, features our jewelry. That’s our Miao collar, Judith Leiber handbag and a big vintage Accessocraft dragon necklace, one of my favorites. Hannan let us have a few extra images and I’m posting them below. The editorial went live today so be sure to check out the complete photo story on Jute. In it’s most pure form fashion jewelry is literally the costume jewelry that walks the runways every season along with its haute couture counterparts. Side note: sometimes when referring to haute couture fashion jewelry, the term is used out of context. Couture jewelry may have been made for a specific haute couture fashion show, but more often it is made by a designer/artist specifically for a client who is a couturier ( a designer/brand that has been legally defined as so because the design house has met rigid French requirements). Constructed by hand in most cases, by the most skilled designers and artisans working together for couturiers, some of the finest vintage jewelry was made… The roots of haute couture jewelry began in France before the 20s, with Paul Pioret and Vionnet using the idea of selling a whole couture outfit. They would create the jewelry or hire producers like Griopix to make a piece specifically for the outfit or client. Yet, the idea of replacing fine luxury status jewelry with “imitation” has and always will be somewhat a matter of taste. 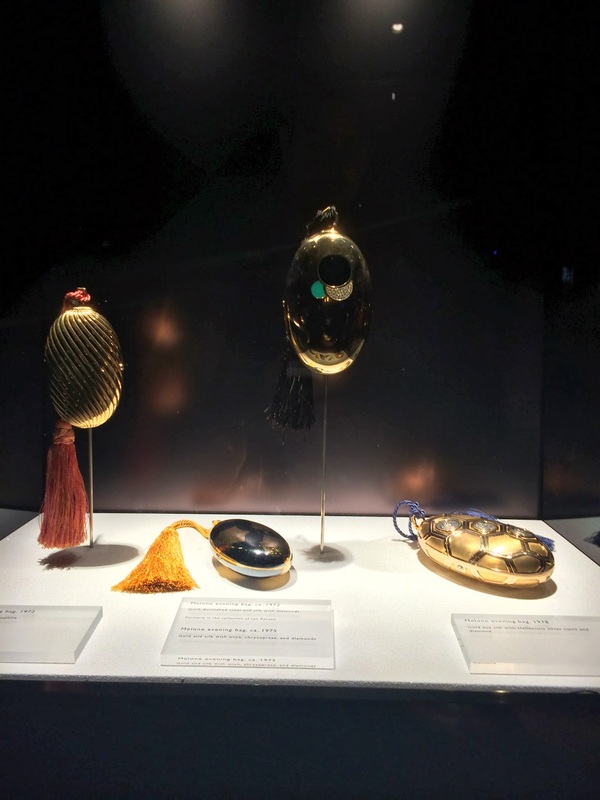 While it seems in the mid 20s and beyond the makers of jewelry for haute couture were overshadowed by their clients: Chanel, Schiaparelli, Lanvin etc… artists like Roger Scemama, who created couture fashion jewelry have begun to take their place in history. Per the basic French definition- the designer creating haute couture must be established as a house producing and a showing a set number of items per season. They go as far to say that house must have a working location in Paris and meet legal requirements. Thus, one of a kind Robert Goossens jewelry for the runway or those he made for specifically for one of Chanel’s clients would be an example of haute couture fashion jewelry made for a certified couturier. We do use the term loosely here in the U.S. Since pieces of privately commissioned fine jewelry may seem to fit this definition, it is important to state, that all those fine examples in some instances could be considered fashion jewelry, but not couture- because they are produced by jewelers not established elite fashion houses who were certified couturiers. I wanted to sort of make sure we define fashion, fine and haute couture jewelry all in relationship to one another and this list of texts I have complied will help to do so. “From Coco Chanel in the 1920s to Yves Saint Laurent in the 1970s to Lanvin today, haute couture costume jewelry has been an eye-catching accessory to enhance a designer’s vision. The dazzling one of a kind jewelry was designed by skilled artisans to complement and adorn individual couture pieces for fashion shows and photo shoots”( Costumer Jewelry for Haute Couture, Florence Muller). “Whether they were produced in minute made-to-order quantities for French fashion houses or in considerable numbers for mass market in America, these jewels fabricated in non precious stones, continue to amaze by their constant originality, their joyful exuberance, and their ingenious compositions. Without the financial constraints and technical obligations of priceless gems, costume jewelry provided the perfect creative freedom for designers to express an astonishing spectrum of signature styles, continually evolving with the latest fashion trends. Instead of concentrating on the size cut, and clarity of a stone, a myriad of costume jewelers developed true expressions and unique creation. In a reversal of roles that pays wonderful tribute to their inventiveness, contemporary fine jewelry is now inspired directly by the whimsical imagination and structural liberties of costume pieces” Pamela Golbin, Forward for Fashion Jewelry The Collection of Barbara Berger. Snapshot from inside of the Fashion Jewelry book, by Harice Simons Miller, from my collection. Image by Pablo Esteva. Thus beyond what is created for the runway or even couturiers lets look at- “costume jewelry” examples by brands from Trifari to Kenneth Jay Lane. They have also created great examples of fashion jewelry. With that said I would not call everything Trifari has created fashion jewelry. Now what about “fine” fashion jewelry, isn’t that contradictory? 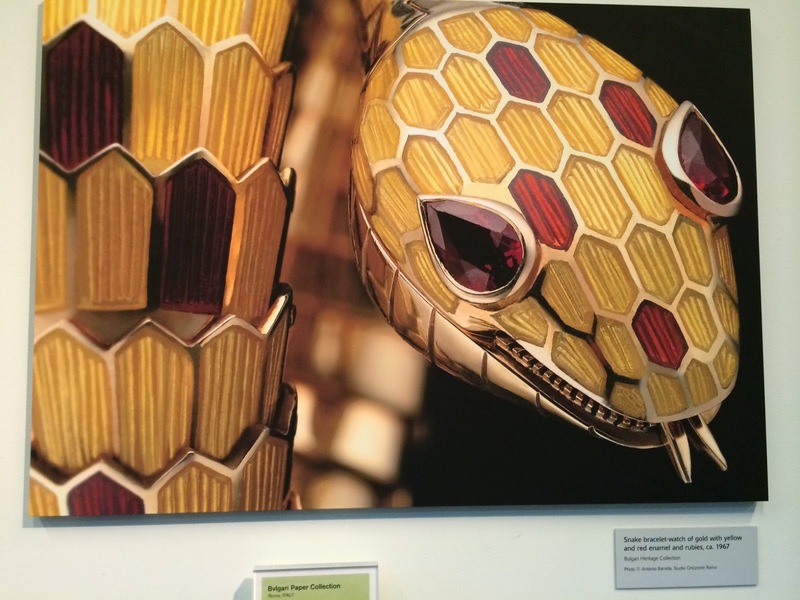 One could argue that for the sake of what’s happening in terms of contemporary jewelry design we must entertain it…. Well, beyond the stones and scale- what is most important to a successful piece of fine jewelry influenced by fashion? I think it is about design, as it references fashion trends/styles in its fine form. I think if there is an era where fine jewelry has a turning point towards fashion, it is the late 50s-60s, ushered in part by creative fashion inspired patrons who started bringing in commissions to fine jewelers such as Van Cleef & Arpels. 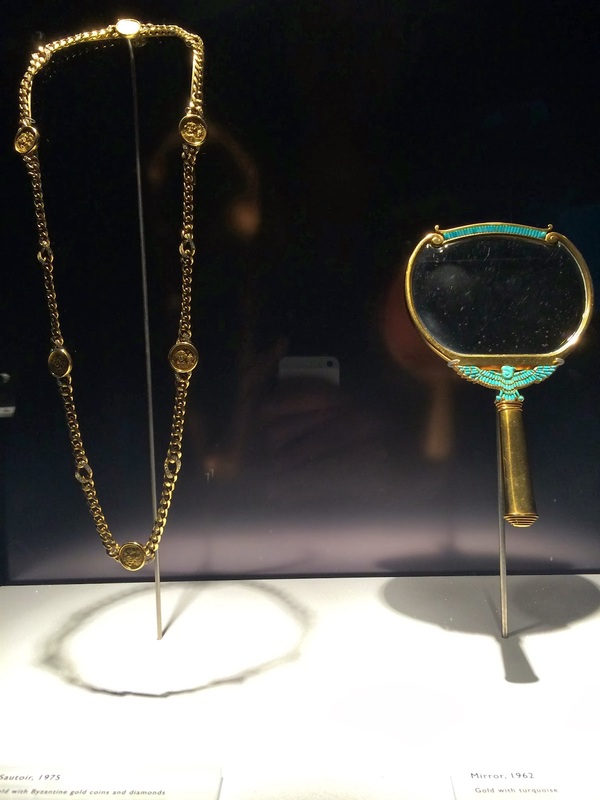 This idea of a “fine” fashion influenced jewelry evolution is interesting… also with jewelers who began using fine metals and less precious stones, woods, shells and such like Verdura, David Webb, Grima, Seaman Shepps…etc. Overall though the scale to obtain the whimsey of fashion jewelry is limited by the monetary worth of the medium. Currently, we are now seeing a flip in terms of fine and fashion jewelry with “lesser” metals so to speak (like silvers, rhodium, brass) mixed with diamonds- fine and precious stones. So as the term fashion jewelry evolves: here are some great texts for avid admirers and beginners alike. Costume Jewelry for Haute Couture. Florence Muller. Edited by Patrick Sigal. Vendome Press. New York. -This latest 2007 edition, with the green jewelry cover can be hard to find -current examples are found here. Explore the links and be sure to ask for the edition you want. The first in 2006 by Grand Hornu press, I believe had a cream colored necklace on the cover. It is found now on ebay. The Art of Fashion Accessories: A Twentieth Century Retrospective. 1993 Joanne Dubbs Ball/ Dorothy Hehl Torem. Dior Joaillerie. 2012. Michele Heuze. Victoire de Castellane. American Fashion Accessories. 2008. by Candy Pratts Price, Jessica Glasscock, Art Tavee. Maison Goosens. Haute Couture Jewelry. Patrick Mauries. Thames & Hudson. Dior. The three set series. published by Assouline. Specifically the Jewelry edition inside. Unfortunately cannot be purchased separately, but if you like Dior this shouldn’t be too much of a problem. by Caroline Cox and Gerda Flockinger. Fashion for Jewels: 100 Years of Styles and Icons. 2010. Carol Woolton. Fashion Jewellery: Made in Italy Hardcover. 2013. Jewels of Fantasy: Costume Jewelry of the 20th Century. 1992. Fashion Jewelry: Catwalk and Couture. 2010. Miller’s Costume Jewellery, Hardcover, 2012. Judith Miller. Fabulous Fakes: A Passion for Vintage Costume Jewelry. 2006. Carole Tanenbaum. Kenneth Jay Lane. Faking it. By Kenneth Jay Lane. 1996. Harry N Abrams. Vintage Jewelry Design. Classics to Collect and Wear. Caroline Cox. 2010. Lark Crafts. Jewelry of the Stars. Creations from Joseff of Hollywood. Joanne Dubbs Ball. 1991. Miriam Haskell Jewelry. Cathy Gordon & Sheila Pamfiloff- Schiffer. 2nd Edition. (Haskell, really bridges that space in her designs and watercolor ads which featured fashions of the time with her jewelry). Image from The Couture Accessory, snapshot of the book, inside pages of The Couture Accessory images. The Couture Accessory. Caroline Rennolds Milbank. Harry N. Abrams. Daphne Guinness, 2011 by Valerie Steele. Accompanied the Fit exhibit, I included it her for fashion fans, such as myself, and to highlight her use of accessories in the book’s images. Vogue and The Metropolitan Museum of Art Costume Institute: Parties, Exhibitions, People. 2014 by Hamish Bowles. Lou Lou de La Falaise. Ariel de Ravenel. Natasha Fraser-Cavassoni. 2014. Elizabeth Taylor: My Love Affair with Jewelry by Elizabeth Taylor. 20th Century Jewelry & the Icons of Style, 2013 Stefano Papi, Alexandra Rhodes. Vintage Fashion and Couture. Kerry Taylor. 2013. Diamonds. A Century of Spectacular Jewels. Penny Proddow and Marion Fasel. 1996. Extraordinary Jewels by John Traina. 1994. The Windsor Style. Suzy Menkes. Salem House. by Yvonne Markowitz, Nonie Gadsden, Elizabeth Hamilton…. Cartier and America. 2010. Martin Chapman. Feel free to comment about or add texts we might have missed below. We’d love to hear from you concerning your favorites too! Lou Lou de La Falaise The Glamorous Romantic, rights reserved. From my copy of the text. I knew of Lou Lou de La Falaise through her work with Yves Saint Laurent and via old photographs. Possibly my favorite image is of Lou Lou and Yves styling model and icon Willy Van Rooy. That moment captures her work philosophy, fashion style and tells you she is the cool girl. Not in the cliche way, but in a very natural fluid way. She’s an it girl because her style seems to flow from within towards the surface. Lou Lou was born of a complex and beautiful model mother, which the book by her name covers quite well. Her father was a French count. Lou, Lou, Willy Van Rooy and Yves, 1980. Image from text, copy also provided by Willy as seen in our interview with her. Her relationship with Yves Saint Laurent was a deep and meaningful partnership, which produced so many outstanding fashion accessories and beyond, so the book really is a truly hypnotic read. I found her years spent working after YSL and her work ethic overall very inspiring. The images of her creations for Yves are illuminated by how she actually wore jewelry throughout the images accompanying the text. The photographs of her style are much welcomed and absolutely essential. The book is not to be missed (Pierre Berge’s forward for instance) and provides wonderful quotes from fashion icons concerning Lou Lou, as well as building a foundation for readers concerning why she was so essential to one of the most beloved and talented fashion designers that ever lived. “I tell myself that I am truly fortunate to have had Lou Lou at my side all of these years because there isn’t a day that goes by when she doesn’t fill me with wonder” (Lou Lou de La Falaise, 132). *IMAGES: Credit-Lou Lou de La Falaise The Glamorous Romantic, rights reserved. I have included my favorite photos from the book in this review. I am drawn to her ever present vintage/antique Turkmen silver cuffs which she mixed with other accessories, seen in two images included. However possibly my favorite cuffs she did, were for YSL haute couture. These in my mind are some of the most telling pieces she designed. They mix that chic, modern and bohemian aesthetic perfectly- that I also ascribe to and love so innately. They are large, not to be missed, a bit wild, yet refined….. It is at this point I pause… I found that the complete review had already been done so well, as the book released in October of this year. Our blog relaunch was in wild swing at that time so rather than not post I did want to highlight this book I enjoyed so much. For a more detailed description: click here. What comes to mind when one hears, Bulgari? The name has become synonymous with high-end jewelry. In fact, there seems to be no comparison for the standard the Italian company has set in the fine jewelry market. 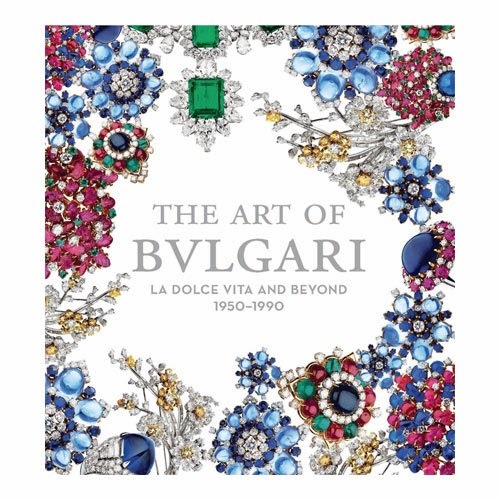 For over a century, Bulgari has epitomized fine jewelry making and maintained the balance of exuberance and class. Image of exhibit entrance. Image Nathan Brandon. The sumptuous jewels characterized by a casual formality are what curator, Amanda Triossi, calls (and many would agree), “…the essence of Italian style at large.” The exhibit currently on display at the De Young Museum in San Francisco, showcases vintage pieces from La Dolce Vita—literally translated “the sweet life”—from 1950 to 1990. This includes a room entirely dedicated to Elizabeth Taylor’s private collection, each sparkle from quarter inch diamonds a testament to the power and grace of women who held the world on a string and a pound of emeralds and diamonds around her neck. 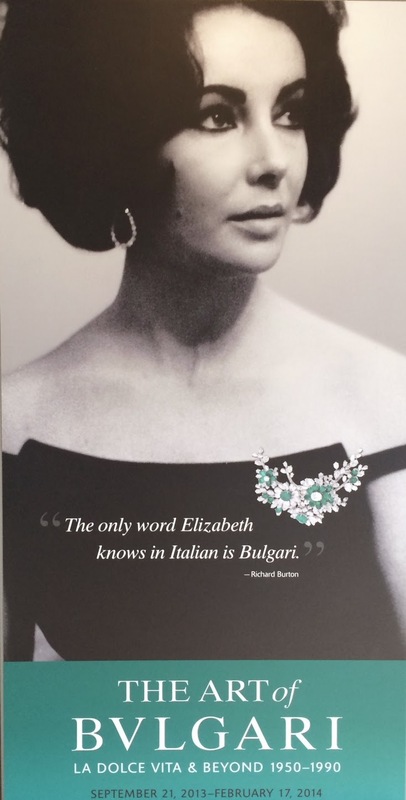 Image of the Elizabeth Taylor banner at museum exhibit. The pieces on display take the viewer on a journey through decades of Bulagri’s distinct interpretation of culture, visual language, and a fantasy world of all that glitters. Each diamond, each sapphire, and each ruby collected is of the highest grade, outsourced from the far reaches of the globe, and each piece constructed by the hands of the best jewelers. With an estimated one thousand hours of work per piece and an impending final inspection that could result in melting the piece back down to the drawing board, the result becomes mystical. To be face-to-face with these emblems of beauty is dream-like and inconceivable. One begins to realize what one is looking at is not simply high-end jewelry: it is truly art. Custom no flash exhibit images created by Nathan Brandon. There are the earlier pieces which hold true to Parisian high jewelry standards: one type of precious stone employed individually with platinum and never mixed with others. Then there are the the early sixties pieces where Bulgari —among a young and vibrant style revolution—began to mix and match. We see the classic cabochon (smooth, round finish on gemstones) mixed high and low. Color is used as if it were a paint and there is no longer the strong concern with the individual intrinsic value of the gemstones. What counts is the ultimate effect, for example turquoise next to diamonds. The recurring ingredients of the Bulgari style in a 1967 necklace—color, cabochon, compact shape, mounted in yellow gold, and featuring emeralds, rubies, diamonds, and sapphires —combine to create the effect of a peacock tail of jewels. Playing Card sautoir, 1972. Bulgari Heritage Collection. Image Antonio Barrella Studio. Known today as the Keira Knightly necklace, it’s a piece that is proof that regardless of era the timelessness of their design is confirmed. 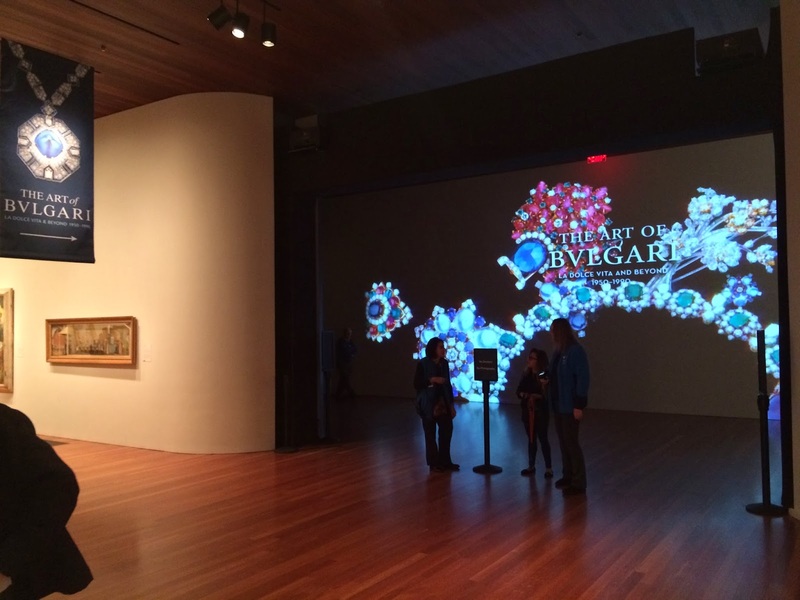 In another room, Bulgari dances with the unique relationship between jewels and other art forms. For example, the coin jewelry of Bulgari derives its inspiration from post-modernist architecture, like the Philip Johnson AT&amp;T building of 1982, which ends in a classic greek pediment. We see sleek modern cuff bracelets and sautoir, or long necklaces, of gold and silver set with roman coins. The past and the present merge. Of everything on display, there are two pieces that speak the loudest; two gifts from Elizabeth Taylor’s fifth husband, Richard Burton, each worn extensibly by Elizabeth both on and off screen. The first jewel she received from Burton, is a spectacular broach of 23.44 carrots surrounded by diamonds that she received on the set of Cleopatra. Elizabeth Taylor brooch, image created by Nathan Brandon. As a wedding gift, she also received a luxurious emerald and diamond necklace to which the broach can be attached as a centerpiece. The other pièce de résistance, which acted as the poster image for the exhibit, is an art deco inspired sautoir made in 1972 and gifted as a fortieth birthday gift with matching ring. This piece is set with a very fine Burmese sapphire of 57.5 carrots and is characteristically Bulgari with the cabochon rounded effect. Beyond its initial splendor it is unique in creation because from the 60s onward Bulgari used mainly yellow gold to set their jewels. This platinum sautoir harkens back to the original days of high Parisian influence. 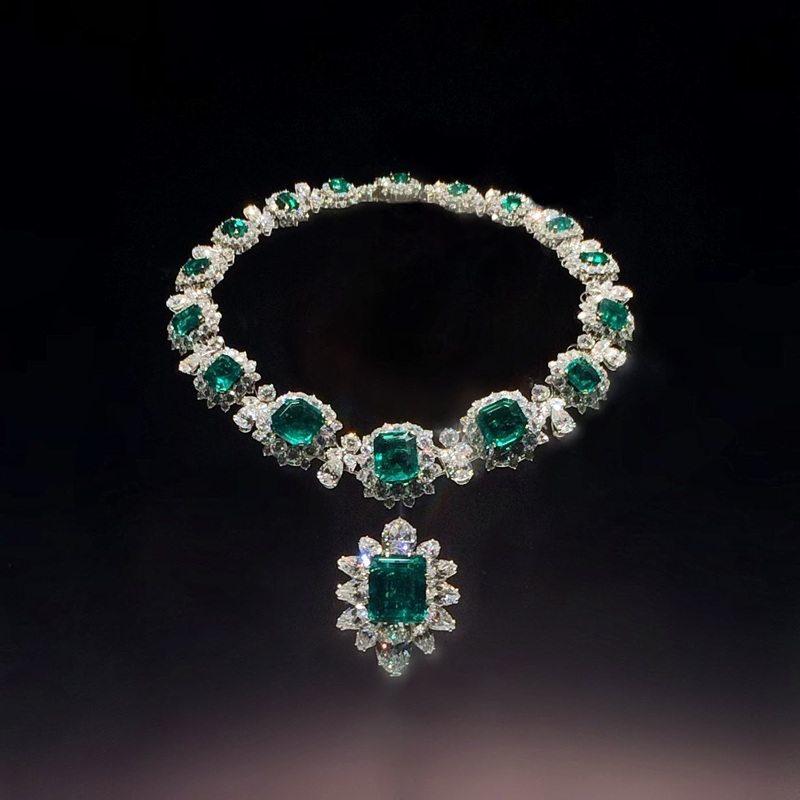 Emerald and diamond necklace, belonging to Elizabeth Taylor. Image created by Nathan Brandon. 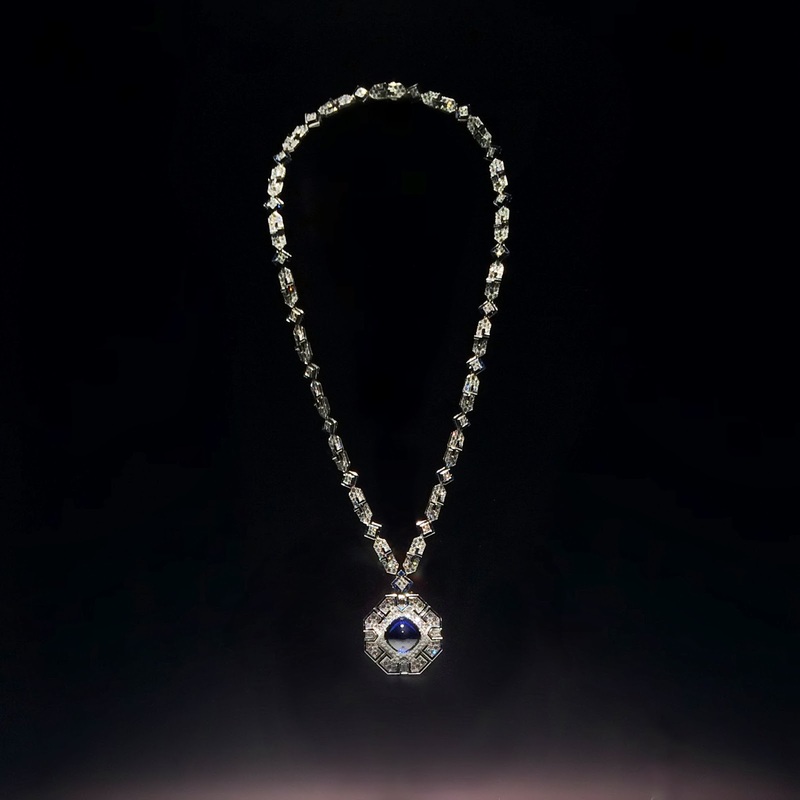 Elizabeth Taylor Burmese sapphire necklace. Image created by Nathan Brandon. Exhibit Catalogue available for purchase here. 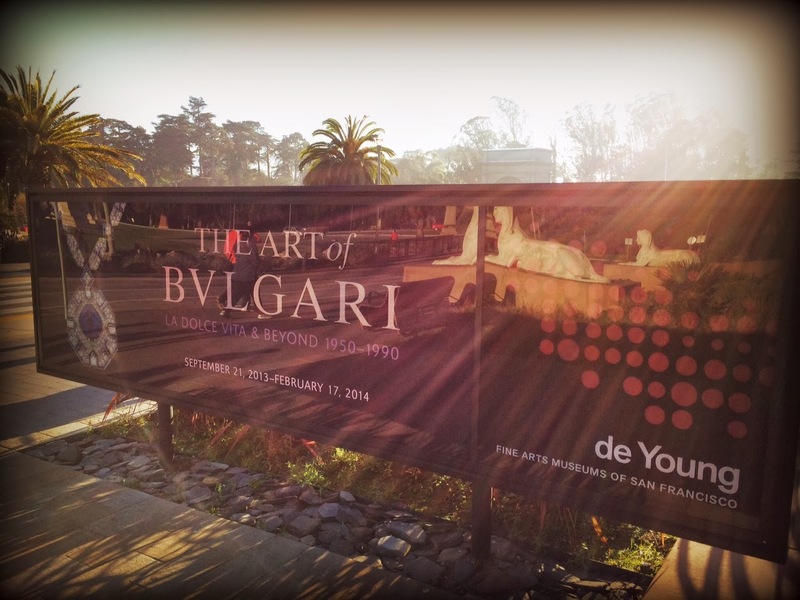 De Young Museum image, courtesy of Nathan Brandon. Writer: Habibi Winter Editor: Nathan Brandon, M.A. Exclusive photos credit: Nathan Brandon, M.A. Knuckle Duster ring, Art Smith. 1968. Brooklyn museum. “Inspired by surrealism, biomorphicism, and primitivism, Art Smith’s jewelry is dynamic in its size and form. Although sometimes massive in scale, his jewelry remains lightweight and wearable. The jewelry dates from the late 1940s to the 1970s and includes his most famous pieces, such as a “Patina” necklace inspired by the mobiles of Alexander Calder; a “Lava” bracelet, or cuff, that extends over the entire lower arm in undulating and overlapping forms; and a massive ring with three semi-precious stones that stretches over three fingers. Trained at Cooper Union, Art Smith, an African American, opened his first shop on Cornelia Street in Greenwich Village in 1946. One of the leading modernist jewelers of the mid-twentieth century, Smith was also an active supporter of black and gay civil rights, an avid jazz enthusiast, and a supporter of early black modern dance groups”. 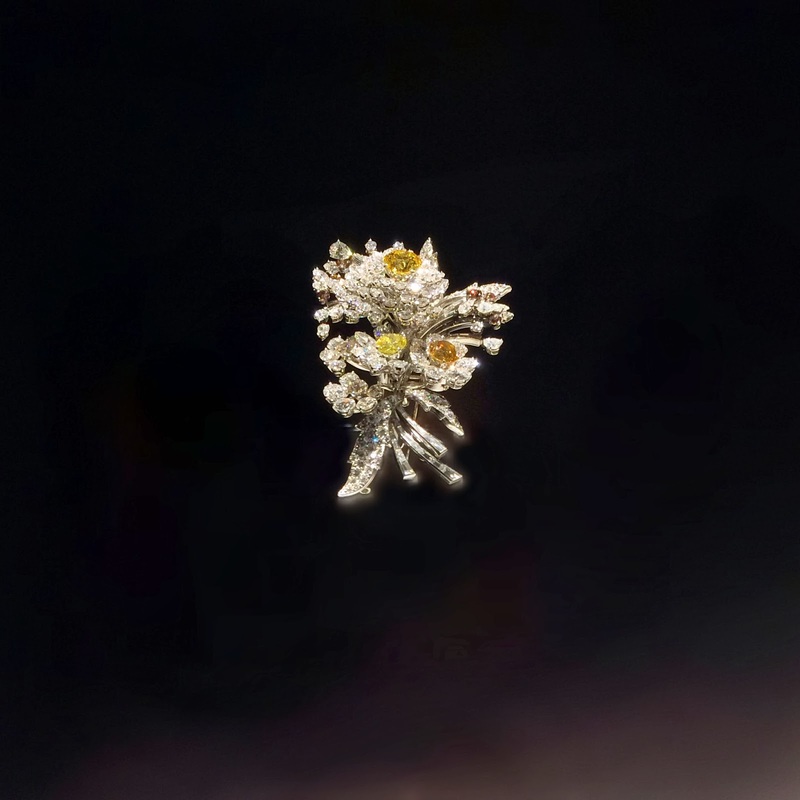 (From the exhibit and online article- Village to Vogue: The Modernist Jewelry of Art Smith-Brooklyn Museum). Boa, by Art Smith.1964. Brooklyn museum image. Lava, 1946. Art Smith. Brooklyn Museum image. Ellington Necklace, 1962- online image from the Brooklyn museum site. Designing for YSL: Willy van Rooy An Inspirational Career. Willy Van Rooy personal image archive. Lou Lou, Willy, and Yves. 1980. Willy van Rooy has lived a life of travel, art, love, design, and is the face of one of the most popular fashion mannequins ever made. One could write her off as just a top model, but they would be missing the core of who she is- an artist and free spirit. Many things about Willy intrigue me- her classic magazine covers, her time as a designer and muse in the 80s for Yves Saint Laurent, as well as her own shoe line. Before gracing the runways of Gaultier and Thierry Mugler among others, she worked with prolific photographers as well as studied at the Academy of Fine Arts Fashion department in Rotterdam. For more fashion images from her career you can see her instagram account. As a vintage textile and jewelry lover, her time designing shoes, prints, and accessories for YSL and Karl Lagerfeld appeals to my curiosity. We explored this here together. Image Provided by Willy Van Rooy. Willy van Rooy, high school street photograph, rights reserved. Q. How did you get into modeling, what was your first big break? A. It all happened by itself, photographers would sometimes ask me, just in the street. Really, when I think back to when I was still in High-school, my friend and fashion freak like me, Sophie van Kleef, and I would pose for her friend who wanted to be a photographer. We posed in the dresses we had made. I wish I had those pictures. I had them for a long time, but because I change places and countries quite often, things get lost. Q. When did you first begin designing or creating in an artistic way? When did your interest in fashion, modeling, and the arts begin? A. Since as far as I can remember. highly elegant public who were the donators and friends of the directrice who was of Dutch aristocracy, a baroness to be exact. I had directed and done the costumes for the play in which I had given myself the role of the princess and the other kids were gnomes. I never forgot the dress which came from a closet that was always locked. There were all these amazing dresses, capes, and furs which were stowed in big sacks, all from that society lady. When there was a reason to dress up, the big bags came out. The dress I am talking about was a long evening dress of yellow satin silk with big elegant grey and white flowers, cut in a way that hugs the body softly. At the time I did not know if it was silk but I remember the softness, so I guess it must have been. A few years later I directed another Japanese themed play in which I had everybody dressed up and that time the directrice hired a photographer to make pictures of me dressed up. There are many more incidents that led me to be a model, although that is not what I really wanted so I did not really look for it. I thought that as a model you had to be perfect with perfect hair and nails… and I’d rather get my hands dirty in paint or spend my time making clothes or just see what is going on in the world. Q. What do you think was different about modeling then and now? like Holland or Spain ( and surely many others but I did not witness those) it was considered a job for “light girls” and not respected at all by the ordinary people. Because of London and the fashion of young real people this slowly changed, but of course not like today, today the models are as famous as the movie stars and are idolized. They can earn a lot of money and respect, which is great. In the early sixties you were expected to have a collection of wigs, stockings, gloves, costume jewelry, make up, and hairsprays. I mean it was a whole suitcase full and then you also had to be a makeup artist, a hairdresser and a stylist. The other day I looked at some Vogue pictures and saw that the make up was not perfect at all, so funny, no one notices I guess. On the other hand it was marvelous in the sense that you could create your image and make yourself look like what you felt like, well not always, but you had a hand in it so to speak. The reason for all the wigs and stuff is that mostly they did not want you to be recognized but rather be a different person every time. Now the thing is to be recognized and everything looks so much more natural and they are open to new things. It was funny for me to see the incredible organization that was going on for the Italian Vogue shoot at the Korean cemetery with Steven Meisel in 2008 in LA. First of all, I got picked up by a beautiful black Mercedes and upon arrival was immediately brought to a delicious breakfast by the best gatherers. There were Trailers with everything one can wish for, tables and tables with accessories and shoes, racks of the most gorgeous outfits, big tents for the photographer and his equipment which include enormous computers so the result is seen immediately and so on and so fort. About 5 make up artists, hairdressers, stylist with a group of assistants. Back then there was an editor, the photographer, an assistant and the model(s). Slowly but very slowly there were hairdressers on the set and even slower the make up artists. For the rest, it is hard work, please don’t think it is all fun and glamour, it is also hard work, specially in my days. If I think of the racks with all the clothes that had to be photographed in one day, planes here and there… yes, it is fun but it is also hard work to be in shape and take care to look beautiful as many people depend on you and there is a lot of money involved. Willy’s style, image courtesy of Willy van Rooy. rights reserved. Q. What was your favorite fashion moment from the 60s? What was your life like then? A. Everything seemed possible, there was a certain freedom because of the knowledge that one was not alone, one knew there were many like you who wanted to express themselves and a good way to do so was the way we dressed. Fashion was young, fashion was new, mostly because it got a whole new public as things were more exciting and more affordable then the designer clothes that were around. My favorite moment was when I discovered a shoe store in London, that I saw sort of hidden in the window in the background, gold leather shoes. It turned out they were original Ferragamo shoes from the 40’s. They were a model’s, the sales girl told me- “they did not know what to do with them”. No problem, hallelujah, they were my size and I bought all 6 pairs of them for next to nothing. Vintage was great to combine with the latest and there was lots of it on the fabulous Chelsea market. The modeling at that time was exciting too. Q. What photographer do you think had the most influence on your career and why? A. Definitely Helmut Newton because it was with him that some different style pictures were made. He was getting known and when I came in, it seemed to be the right time. I think the pictures we did together were new and people thought they were exciting. The thing is I was such a nomad and disappeared to Ibiza or India sometimes for a year or more, otherwise we would have made many more pictures together. As he told me once, I was the only model he would ever think to ask to be under contract with him, but I told him that was not necessary because I would always choose to work with him first. In reality maybe is not always true because doing all the editorials is great but you also want to bring home the bacon. Willy van Rooy walking in a YSL show. Q. What was your favorite part of working as a model for YSL and how was the transition to designer for you? How exactly did this happen? Yes, thats what happened and after that I designed lots of perfume and powder boxes, jewelry and umbrellas, tee shirts, bathing suits and lots of hand bags and shoes. It was great fun, I had a lot of pleasure drawing them and what they at Yves Saint Laurent liked about it was that if I designed T shirts or bathing suits, I would draw the jewels and belts as well, just because I liked it. Q. What pieces did you design for YSL and Karl Lagerfeld? About how many jewelry designs would you estimate? Do you have any examples of these you saved or images? A. Like I said, for YSL I designed all kind of things and for Karl Lagerfeld mostly prints, something I like to do very much. I did design prints for YSL too and some jewelry for Lagerfeld as well. The thing is that at that time it was not so easy to make copies in color and so on and often you forgot or did not care in the end. I do have photocopies of a lot of it but in black and white. WWD cover with her prints for Lagerfeld. 1980. These days one would just do it with the Iphone and gets a great copy. In the end they actually used little of the original designs I made for them because it is more a inspiration for the accessories, I would sometimes see a glimpse of it in some jewelry or especially the shoes. I don’t really know what they were selling and weren’t so I don’t really know if they made up the umbrellas or handbags that I had designed. Everything was kept though for later times or whatever. The prints for Lagerfeld were different because he really used them and when I saw the show and all the girls coming out in silks and satins with the prints I designed, that was really something else. I have some newspaper cuttings of the Karl Lagerfeld prints in the WWD but to be honest I did not check it out very well, once sold, something new is coming and that was it. Willy’s original jewelry and accessories sketches for YSL. Q. On your blog you displayed some original sketches from YSL- how many do you have in your possession? A. At a point when they were selling the YSL label Anne Marie called me and gave me back some of my original drawings because, as she said” Monsieur St Laurent had liked those very much and you should have them, maybe one day you can do something with them”. So, yes, I have about 20 originals drawings I did for them. Q. Many vintage lovers adore Yves Saint Laurent’s Rive Gauche collection- do you have a favorite piece you modeled? A.Yes, me too I love most vintage YSL but the Russian inspired collection was really one of my favorites and I have one of this lovely Russian suede hats with fur, red and Black which is an original, used in the show… other pieces of designers I had I gave to my sisters because I really only wear what I feel best in. The only vintage clothes I wear are also my own. Saint Laurent ad, Eric Boman. Q. You are sort of synonymous with YSL- so many fashion ads…. They are often used when researching vintage designs. Do you have a favorite campaign? A. My husband and I met on a photo shoot with Helmut Newton for the English magazine The Observer. I was booked for 3 weeks with Helmut for different jobs in Marrakech, Morocco, some publicity’s, Elegance and 3 series for the Observer. One day he saw 2 very interesting looking young men in the street with an Afghan dog ( they looked foreign and were actually Spanish) and he later thought about it and send some people to find them and ask them to be in the pictures he was going to make the next day. I already had seen them as well in the Marrakech souk, you could not miss them, and to make a long story short, we fell in love right there the morning they showed up for the shoot. I was waiting in the bus doing my make-up and there they were and I only remember seeing Salvador. Now he was sitting beside me in the car and the moment he offered me his pipe of kiv and we looked at each other… Later we were posing together so we have this wonderful pictures by Newton from the day we really met. The next day the whole crew was leaving for London but I stayed in Marrakech to the chagrin of Helmut who had booked me already for weeks ahead. Irving Penn. Vogue image of Willy’s shoe. Q. In the 1980s you designed a quite successful shoe line under your own name, worn by famous women and fashion lovers. Why shoes? A. It was the only thing I could not make myself and shoes had always fascinated me as I had designed some shoes for YSL. Sometimes I had my shoes made up after my own design, there was a good shoemaker I knew in Milan, Italy, and later in Spain. The marvelous boots one could have made up, the best shoemaker of those was in Marbella, now it is not what it used to be 40 years ago either. The thing is that in 1980 I was in Spain and Spain is a shoe manufacturer country which was an interesting fact to explore. Shoes on my mind because one day when I was bringing my drawings to the YSL house, I met up with the man who was responsible for the production of the YSL shoe line and he told me I had an extra ordinary feeling for shoes. It is not only the design but the balance and the comfort and soon. He gave me a few incredible wooden shoe forms and some courage to start my own shoe line if the opportunity appeared. It did and in 1982 I had produced my first shoe collection in Elda,Alicante, Spain. Q.How many collections did you design and what inspired your favorite pair? A. About 2 collections a year for 10 years. Many of my shoes and boots were inspired by the wonderful brocades still available in the area which they used in their yearly festival costumes. It was also tricky because some of it was hand woven in could take months to produce. It is hard to say which is my favorite but some models I sold over and over again for many years… they also happened to be my favorites. Q. In what way was the Tunic Unique indicative of the era, what was it’s impact on your career? A. well, everything comes together. Because of my career as a model I knew many people and many knew me. I got a lot of help from Karl Lagerfeld who bought them for all his friends and everybody who worked at YSL including Lou Lou and Dear Anna Piaggi and all the models I knew, it was a blast and I got a lot of publicity. Celebrities wearing and press about her Tunic Unique. Q. What other fashion houses have you designed for? A. In the 90’s I lived in Madrid and designed for the Spanish designer Juanjo Rochefort who had a lot of celebrity clients and I designed mostly evening dresses for him. It was a lot of fun. Q. On your instagram account I see quite a bit of wonderful images from your career and related to your husband and children? How has and does your family and especially your husband continue to inspire you? A. Thats the point, they never stop to inspire me, my family is most important to me, probably because that is something I have not known and my husband always surprises me with the art he makes and that is very inspiring. We are very lucky like that, to have our art and have each other. Not that these things come bythemselves, you have to work at it. Q. Do you wear vintage? What is the oldest item in your wardrobe? Do you have a collection of your shoes? A. No, I don’t wear vintage except my own and the oldest piece, my faux fur coat, is 26 years old (not that vintage really?) I do buy vintage sometimes because I am full of admiration for the workmanship but really I think that young people look great in it combined with the latest accessories. Or I love and wear the vintage jewelry, that looks always good and again, it is the artistry that went into it that mostly enchant me. Dressing vintage for me now would look like I never left it. One of Willy’s latest jewelry illustrations. rights reserved. Q. You design jewelry today and have your own shop- how would you describe your aesthetic? A. I do sporadically design and make up a piece of jewelry or bags and sell it in my online Etsy shop but to tell you the truth it is too much work, I always want to make it very special and it does not pay in that way so I only do it when I really feel like it and then mostly give it away. What I do enjoy a lot is drawing them, that makes me really happy. Leather and vintage component necklace, created by Willy. Q. What other projects are your working on? A. Right now I am working on a book of my illustrations and if possible would like to make a book of my shoes and all the adventures that went with it. Also a book about the wonderful work of my husband… We just released the new SHOP, I have been working on with my son and daughter, which is very important. It contains designs and product made by the Willy van Rooy label. We have ambitious plans….so much to do. Yet we have to take care to take the time to look at the clouds and the beauty around us, so I am going step by step and every day is a new day. After conducting this interview, I am in even more awe of Willy’s life and passion for it! If you are also more enamored, please check out these links for more Willy van Rooy!